Watch how the Handy Ma'ams make a dream come true! This door was never properly installed, and has obviously been repeatedly kicked in and poorly repaired. The Handy Ma'ams completely replaced the frame and properly installed heavy duty strikeplates for better security. From allergan filled carpet to beautiful hardwood floor! 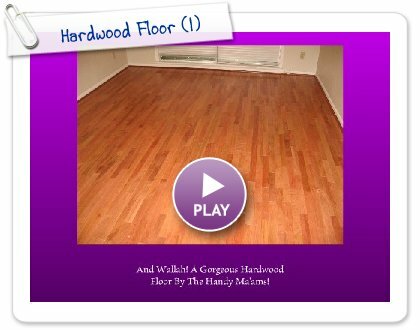 See the steps we went through to install a beautiful hardwood floor. This opens a new window, so when you are through watching, just close the window. Closet Piled Up and Messy? Organized with Shelves and Cubbies! 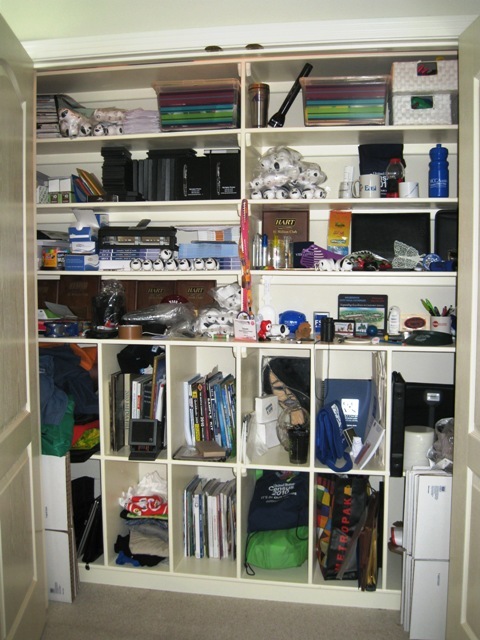 Our client started a business and wanted to use her office closet to store and display her wares. But there was only a couple of flimsy shelves, and she wound up with bags and boxes piled up, rendering the closet useless and a repeating chore to find and retrieve the items within. The Handy Ma'ams discussed her needs and came up with a combination of shelves and cubbies to maximize the utility of her office closet. We used very strong plywood to support the weight she needed to store away her goods. Now her closet is organized and holds more than ever! Tired of Hauling clothes Up and Down Stairs? A Laundry Chute Saves Effort! This client was breaking her back hauling load after load of laundry up and down the stairs in her house. The Handy Ma'ams discovered that this client's Master bedroom closet was directly above the laundry room, so we constructed a laundry chute that looks like a clothes hamper in the closet, but provides an express lane to the laundry room! We also added a pulley system to make it easier to get the clothes back up to the upper floor. The hook can hold either clothes on hangers or a mesh clothing sack to reel in her family's folded clothing when it comes out of the laundry. Unused Yard Space . . . This spot in the yard was sitting unused. The Handy Ma'ams converted it to useful storage space by leveling the ground, building a pressure treated wood base, and then assembling a really nice shed. This kit included gable vents, a window, shelving, and two battery operated lights. This pet door was installed through the wall to avoid modifying the door, yet providing freedom to our client's dog. Pet Doors can be installed through the wall, or in a door (sometimes requires door and glass modifications). Once in, your pet can come and go without requiring you to get up to open and close the main door. This Garage Door was rotting and falling apart. It had holes here and there, and was growing mushrooms at the bottom. The door was so dilapidated that our customer was scared to try and open it. It just left their garage cold and drafty. We replaced this with a new steel garage door, fully insulated, with weather stripping all around. We added additional insulation in the garage attic space, and wrapped the customer's HVAC vents with insulation as well. Combined with a new garage door opener, this garage just became easy-to-use and comfortable too! Our customer's father brought this heirloom piece of mahogany (the largest single piece of mahogany I�ve ever seen) back from the Honduras some 50 years ago. Notice the tiger eye effect � both of the pictures below were taken with the wood in the same place � I just moved the camera angle and the sunlight lit up the orange in the wood. It is really a beautiful piece. Our customer entrusted this heirloom to the Handy Ma'ams to make a Dining Room table using this wood as the top. The top is Honduran Mahogany (which you can�t really get in large sizes anymore). So Brandy has made the base and legs from African Mahogany. 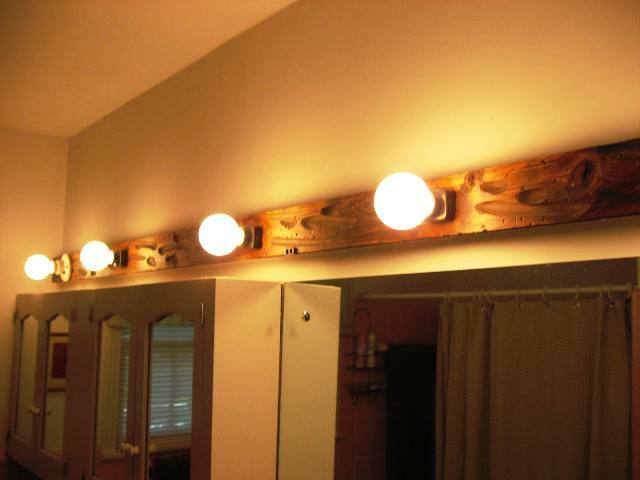 This peice really shows off Brandy�s skills � she is such an artisan! She really enjoyed working on this too. Eric just moved into his new home which has a nice loft above the living room. Eric thought it would make a great library - but where to put the books??? The Handy Ma'ams converted the closet into a beautiful and functional bookcase by removing the doors and installing sturdy bookshelves. Eric will store the original doors and hardware in the garage in case he ever moves and needs to convert it back. When this staircase was beautified, the wall was knocked out to reveal the landing and an attractive handrail was added. Only thing - it was installed incorrectly. Notice there are no newel posts or other stability hardware installed. The handrail was fastened to the walls with just screws in sheetrock - a recipe for disaster. Plus, on one end, when the installer pre-drilled the hole, the drill bit broke off. So he just left it! The Handy Ma'ams added some beautiful brawn to this staircase, adding half newels on each end, and a full newel post at the point where the stairs start their descent. Now it's not only beautiful, but SAFE! This beautiful yard swing was a great idea, but the builder got the blocking wrong, so it soon threw our customer's spirits into a slump. Then she called the Handy Ma'ams and we have her set for swinging through those balmy spring and summer days here in Texas! Our customer Ling asked us to make his fence better. Not only was his old fence broken, the gate hardware was installed incorrectly, making it difficult to open and close the gate. Ling was concerned about costs, so we reused the existing posts, compensating for their being set out of square or plumb. We also reused the gate hardware, installing it properly. Now the gate works great! 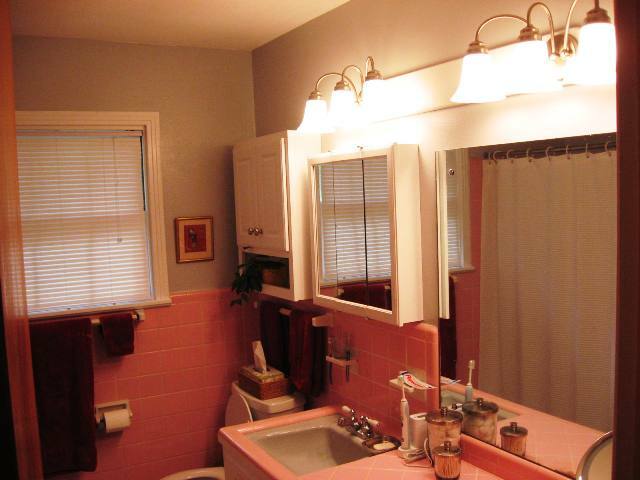 We went time travelling in this bathroom, with the top picture showing the starting point, finding our way through several layers of paint and wallpaper and even more coats of paint on the cabinets. Our customer, Mary Jane, wanted to brighten up the look of this room, getting rid of the old wallpaper, repainting the cabinets, installing new pulls on the doors and drawers, and replacing the light fixture and medicine cabinets with something more up-to-date. But she had a little trouble deciding which new fixture, which new cabinets, which new knobs and pulls, and which new colors. So, we went to the home improvement store with her. Though she wanted to update the look of the bathroom, she also wanted to preserve the tiles which are still in great shape. Mary Jane proved that she has a great sense for decorating, she just needed to see some of the choices before making those final choices. 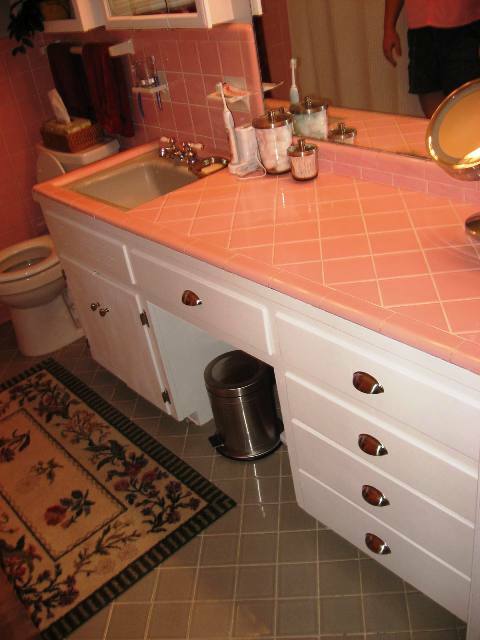 This bathroom proved to be a challenge, but we took our time and handled each item as it revealed itself to us. This includes refloating the walls after stripping the old wallpaper, and recaulking around the tile in the tub. We had to completely strip the paint off the cabinets. We repaired one of the cabinet drawers that was falling apart. We resized several cabinet doors that were too big, and had consequently not allowed the cabinets to close fully. 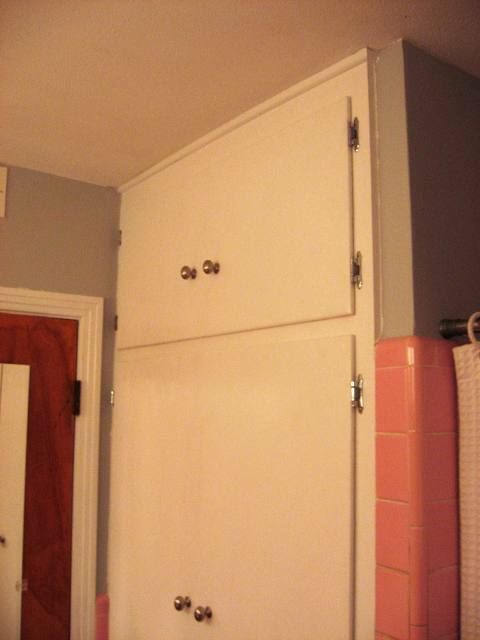 We fabricated new doors for the cabinet under the sink - the ones that were there did not match the rest. We also found some rotted areas in the cabinets built into the wall, which we cut out and repaired. Mary Jane also decided on a new and larger mirror for the bathroom door. We installed this with padding underneath to protect the door and keep the mirror from rattling. Finally, We had to move the power box up about 4 inches to accomodate the size of the new light fixture. I included the last picture because it shows up the details of the ligth fixture a little better. We did not see the need for some of this when we first did the estimate. We worked with the customer on this, and Mary Jane pitched in with the painting one day, and we worked with her on the price adjustments to ease the pain. 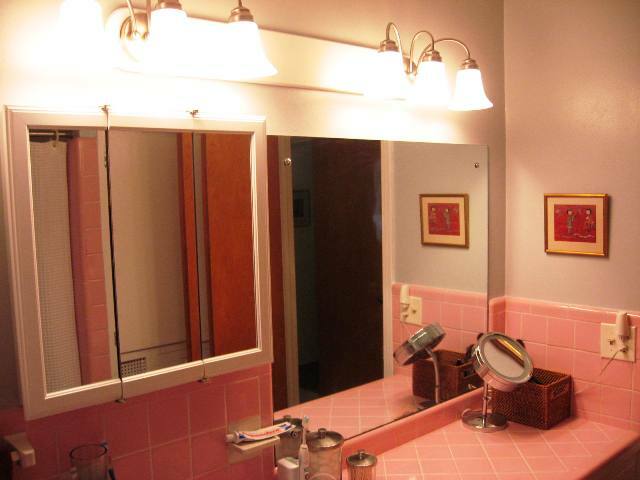 After re-priming and painting all, Mary Jane jumped in and redecorated, and the whole bathroom just popped to life! The salon's treatment room had a hollowcore door which sound travelled through too easily. The Handy Ma'ams replaced this with a better door designed to block sound and made the skin treatments room more private for the salon's clients. Jon Davis, the Salon's owner, praises Brandy's "commitment to perfection" in all the work she has done to make Salon Muse more functional and productive. At Salon Muse, Brandy converted the dead space in front of the HVAC units into a little dressing room for clients. Now people can change before having their color work done, and protect their valuable clothes. 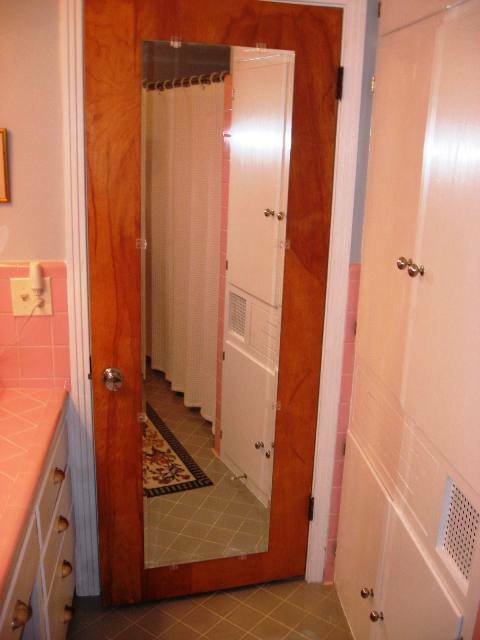 The doors inside hide the HVAC unit attractively. Before Brandy got there, these doors had extra HVAC vents in them that were quite ugly. Brandy got rid of them, hiding the HVAC unit attractively. There is also a nice row of coat hooks to hold smocks and client clothing. Customers of Salon Muse in Austin now enter via the side entry garden thanks to Handy Ma'am Brandy. Brandy changed the door to open from the opposite side so customer's wouldn't be squeezed against the back wall of the garden. This allowed creating the checkout desk, also built by Brandy, right next to the door. Before Brandy's work, customers came in through the front. Moving the door to the side allowed the space by the original entry to be converted to a utility closet and hairdryer room. While at Susan French's home, she mentioned that she really wanted a defferent style chandelier in her stairwell. She already had the one she wanted picked out, and just wanted to know if we could install it. OF COURSE WE CAN! We're the Handy Ma'ams! Susan ordered the lamp herself, and we came out and installed it. When she turned on the light, she just got the best smile on her face! We received this email from Susan . . . If I want it done - you're the ones to do it. You have twice repaired something in my home. 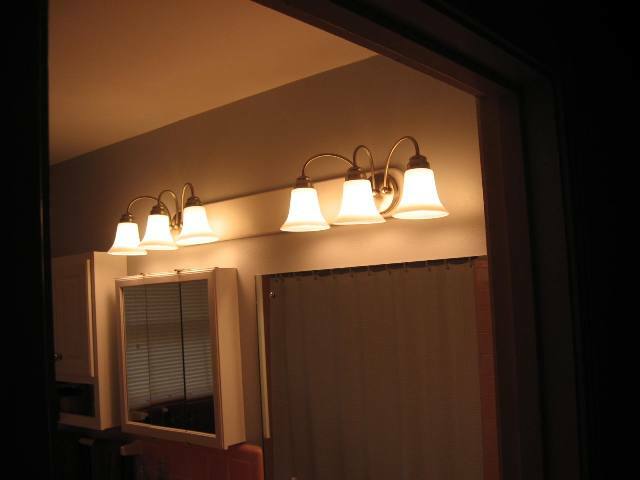 The light you installed looks awesome; and I am pleased with your service as well your eye for perfection. Door now Fits and Works Properly! This good looking entry door was never sized to the opening properly, and it was tough to open and close. The sweeps at the bottom of the door were crammed in too tightly. The doors also sagged at the center, further aggravating the problem. The Handy Ma'ams aligned the door in the frame first, then took the doors down, sized and resealed the bottom properly, installed new sweeps, and fresh weather stripping that actually matched the white door frame. Our customer, Susan French, upon seeing how easily her door opened and closed, went and got her "EASY" button and pressed it! "That was easy! ", the button exclaimed. This old front door had broken glass and wouldn't stay closed unless you locked it. We replaced the front door with this beautiful new Mahogany door. According to our customer, Alycia Erickson, "Our beautiful and functional front door was installed by Handy Ma'ams. They rock!" How Can We Be Handy For You?